This double-pack Cd set includes two concerts recorded at Paris, France during the mid seventies. This is not an official release and was released without the legal right to do so. So this package is not for sale. But few months later skilled guitarist Adrian Fisher was fired shortly after the recordings of "Propaganda" Lp due to the fact that he was too prominent in his opinion and wanted to have a saying in the direction of music that the Maels should go into. So when Sparks went back to play a second time at the Olympia Theater in October 1975, Trevor White was the only guitar player on stage. Sparks had a french support band called Il Barritz from the Basque coast as guest ! On disc one we can find sixteen Sparks' songs recorded live the 30th of November 1974 at the Olympia Theatre, Paris, France. Songs performed are from "Kimono My House" & "Propaganda" LPs plus a rendition of "Girl From Germany" from Sparks' second album "A Woofer In Tweeters' Clothing". The sound quality of the recording is pretty good, the sound having been directly captured from the mixing desk. The second disc contains a live gig at the Olympia Theatre, Paris, France the 11th of October 1975 at the end of the afternoon - the show began at 05.00 PM. This concert was organized by famous KCP Productions and promoted by the French national radio broadcasting network so some live tunes from the gig were airplayed on radio channel France Inter during the show "Pas De Panique" hosted by Claude Villers. 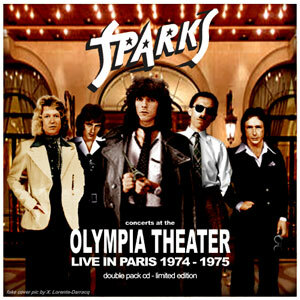 Disc One - Sparks At The Olympia Theatre 1974 : 1. PROPAGANDA - 2. TALENT IS AN ASSET - 3. B.C. - 4. THANKS GOD IT'S NOT CHRISTMAS - 5. IN MY FAMILY - 6. REINFORCEMENTS - 7. SOMETHING FOR THE GIRL WITH EVERYTHING - 8. BON VOYAGE - 9. HASTA MANANA MONSIEUR - 10. ACHOO - 11. ALABAMY RIGHT - 12. NEVER TURN YOUR BACK ON MOTHER EARTH - 13. THIS TOWN AIN'T BIG ENOUGH FOR THE BOTH OF US - 14. AMATEUR HOUR - 15. GIRL FROM GERMANY - 16. HERE IN HEAVEN. Scarce live recording featuring Adrian Fisher on guitar along side with Trevor White, testimony to the era of Sparks early Island years. Disc Two - Sparks At The Olympia Theatre 1975 : 1. SOMETHING FOR THE GIRL WITH EVERYTHING - 2. IN THE FUTURE - 3. FALLING IN LOVE WITH MYSELF AGAIN - 4. HOSPITALITY ON PARADE - 5. THIS TOWN AIN'T BIG ENOUGH FOR THE BOTH OF US - 6. AMATEUR HOUR - 7. GET IN THE SWING - 8. HOW ARE YOU GETTING HOME. At least the last two tracks were airplayed on France Inter Radio. Sound quality of the recording is astonishing, the music having been directly captured from the mixing desk. Unfortunately this recording doesn't offer the whole set of Sparks and only eight songs are available on this Cd. In the mid seventies, due to the huge success of Sparks in Europe, Island Records planned numerous photo sessions. 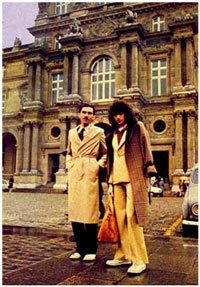 So in 1975, as the band had to play in Paris, France, Ron and Russell Mael did a photo session at "The Louvre". By a rainy day they went to the Parisian Art Museum, and if it's well known that the Maels were involved in arts, maybe this visit was a reference to the song from "A Woofer InTweeter's Clothings" album too. Famous photographer Jean-Yves Legras from "Best Magazine" was by their sides. At this times Jean-Yves Legras was one of the finest international rock'n'roll photographer. Few weeks later, "Best Magazine" published the photos and this review from 1975 still remains the best one about Ron and Russell Mael in the french rock press ever. In France, in the mid-seventies, "Best Magazine" was the second most popular rock magazine, the best-selling one was "Rock & Folk" magazine which still exists nowadays. Sparks on Don Kirshner Rock Concert. 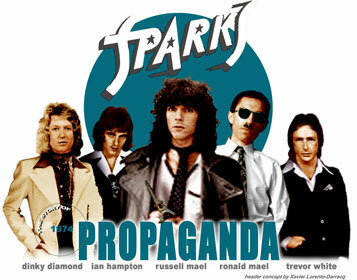 Sparks' Propaganda Lp was released in America in January of 1975 and the band soon appeared in a barrage of television appearances including NBCs Midnight Special, ABCs In Concert (they were introduced by Keith Moon and Ringo Starr) and that famous syndicated Don Kirschners Rock Concert.